Becoming a Power Seller & Top Rated Plus Seller on Ebay is a difficult feat that takes lots of hard work, dedication & consistency. How would you like it if much of this hard work could be minimized & at the touch of a button. No more hunting around ebays' difficult to navigate information website, to execute an extremely time sensitive task, to be foiled by missing a deadline, missing the mailman or misplacing your tracking info. 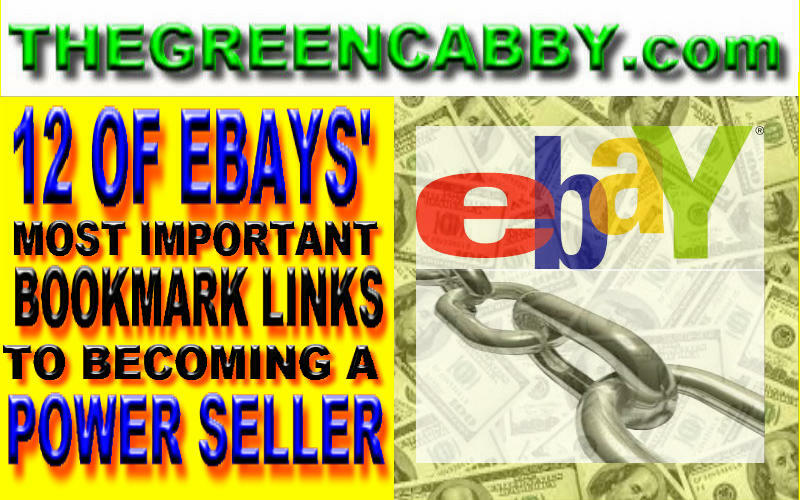 We here @ thegreencabby.com have compiled to 11 most important links you will want to bookmark and make these important tasks easy & ready to be quickly completed when necessary. First of all you will want to create a folder either on your bookmark toolbar or in your bookmark list to keep these links together and organized for later use. 1st Step SAVE THESE 2 PHONE #'s IN YOUR PHONE you will eventually need them. Once that is done check out our video below describing what to do with each of these links & why they are important. Dont let fees overwhelm you pay as you go! Sometimes you will have buyers ask to withdraw a bid, this decision will be completely up to you. Or if you see malicious bidding you can cancel a bid. Track your staus on your road to becoming a Power Seller & Top Rated Seller - which will get you your 20% off fee discount with a whole host of other benefits! Most especially custom form plastic holder for you priority shipping labels no more taping them on. & Priority flat rate boxes & padded envelopes!!! Here is a previous video in our series that shows you how to prevent EBAY BULLIES & SCAMMERS from stealing your cash & how to get PAYPAL & EBAY to protect you always!